It’s been yet another busy day apps-wise for Google, and having rolled out a new Classroom app for iOS and Android users, the company has also taken the wraps off a major update to its Translate app. Notably, there’s a great new feature that can automatically translates words as they’re detected using a mobile device’s camera. This type of real-time translation is not a new concept, and has, in fact, been lurking for years in the form of Word Lens app on iOS which Google acquired recently and added the technology to Translate app today. It’s a welcome addition to the fold, and although this new feature works without an Internet connection, it does arrive with one or two early limitations. As you’d expect given its fledgling state, Word Lens feature only caters to a handful of languages at present, supporting the translation of English to and from French, German, Italian, Portuguese, Russian and Spanish. The Big G is working on adding more languages in the near future, though, and for a first run, the assortment of options is actually rather impressive. There’s another relatively significant new feature to be found in the latest version of Translate, and it’s one that Google hopes will help with the flow of inter-lingual communication. Within the app, you simply select your designated language, tap on the mic button and begin speaking. Hit the mic button again, and the app will quickly detect which language is being spoken, and for the remainder of the conversation, you won’t need to partake in any further tapping or configuration. 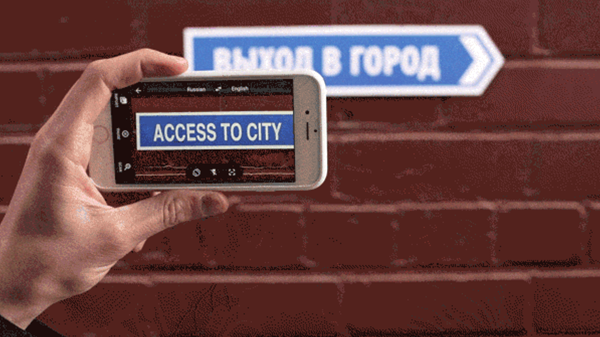 Translate has long been a powerful free tool for those seeking convenient means through which to comprehend and communicate in different languages, and with these novel new features in tow, it’s now more powerful and useful than ever. Like many of Google’s software products, it’s hard to remember the Internet without it, and despite the longevity of Translate, Google remains as dedicated as ever in its strive for improvement. Grab it below, and do leave your thoughts via the usual channels. Thanks. About time for Portuguese (Portugal). Can’t see the ‘Word-lens’ feature on the iPhone yet, just the voice. hang on… it updated… and now it’s amazing. You will most likely need this in countries with roaming charges reaching $50/Mb. Making it utterly useless. T-what? not available to 90% of the world, how is that going to help? not in US? then I don’t know. I would not need an app to translate US signs.